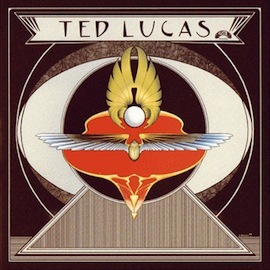 Ted Lucas got his start playing in a Detroit folk revival band called The Spike-Drivers, eventually leaving to form other groups The Misty Wizards, Horny Toads, and the Boogie Disease. While he was a respected figure in Michigan’s folk and rock scene, his self-titled solo album (recorded largely in his attic studio during 1974) failed to break beyond local recognition. The promo sticker nails the sound, placing Ted Lucas next to legends John Fahey, Nick Drake, and Skip Spence. It’s a right on comparison when you hear what this album has to offer. Each side of the record is plainly its own thing; Side A being a suite of six perfectly sweet folk originals and Side B containing an instrumental, an extended blues jam, and an 8-minute raga. The first three tracks have melodies that seamlessly weave in your head on first or second listen. “I’ll Find A Way” is the sleeper knockout, tucking in after the record’s gorgeous three song opener: “Plain & Sane & Simple Melody,” “It’s So Easy,” and “Now That I Know.” These tunes are so easy to love and will have no trouble lodging comfortably in your head. I can’t hold back how much I dig the side A closer “It Is So Nice To Get Stoned,” especially when “Sonny Boy Blues” on side B warns “you better stop drinking that wine.” Arrangements are sparse: acoustic guitar gracefully ornamented with sitar drones (Lucas played uncredited sitar on the Tempations’ “Psychedelic Shack“) and delicate electric fingerpicking, some auto-harp and tasteful percussion elsewhere. For a lost psych-folk record, the sound is remarkably current. Thanks for the Ted referral. I’m an insta-fan! Arrrgh… Does any one know where this is in stock in LA?? Does anyone else think Dan Reeder sounds like this guy? five minutes ago the song “its so nice” was on air on drs3. yes! easely to love! i’m looking foreward to get this album….